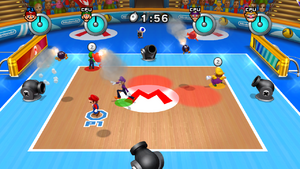 Bob-omb Dodge is a party game in Mario Sports Mix where the sport of this game is dodgeball. This game can be played with up to four players, in three different courts: Mario Stadium, Ghoulish Galleon and Western Junction. The aim of this game is to dodge the Bob-ombs which are shot by cannons placed around the court. Apart from ordinary Bob-ombs, there are Giant Bob-ombs which are more dangerous and green Bob-ombs which follow a player. Some Bob-ombs immediately explode, but some stay on the ground before exploding and can be kicked into other players. Players have two minutes to dodge as many Bob-ombs as possible. When time runs out, the player with the most health remaining wins the game, but if everyone is out before time has expired, then the player who stood in the longest wins. Time will also run out instantly if all human players are eliminated, if so (and there is at least one CPU left), the player with the most health remaining wins. When played in Tournament mode, the player's entire team participates, along with one (or two if playing a 2-on-2 tournament) random character. However, the player can only play as the captain of his or her team; the teammates are all CPU-controlled, unless more than one human player is participating. However, the objective is to survive the full two minutes, even if the three other players are eliminated from play. Finishing in 1st isn't required, the objective will be cleared as long as the player survives. If the team has 2 or 3 human players, they all share the same health bar, meaning if one of the players loses all their health, the whole team loses. Areas with six cannons (or eight for Ghoulish Galleon or Western Junction) can be unlocked by winning several alternate route courses in Dodgeball or by winning 20 matches for each court. The large Bob-ombs appear only in this version. There are three sizes that the Bob-omb has. Bigger sizes means more damage the player takes. This page was last edited on June 10, 2018, at 08:28.